PORTLAND, OR--(Marketwired - Dec 22, 2014) - Eastside Distilling, Inc. (OTCQB: ESDI), an innovative and fast-growing premium producer of hand-crafted spirits, has opened Oregon's first customer tasting experience retail store at the Clackamas Town Center mall in Happy Valley, about 10 miles southwest of downtown Portland. The new concept store builds upon the success of Eastside's flagship distillery, where customers can tour, sample, and purchase its award winning spirits direct from the company. While there are a number of wine tasting rooms located in Oregon malls, Eastside's new Clackamas Town Center store represents the state's first retail tasting room for spirits in a mall location. Now, for the first time, mall goers can enjoy a unique tasting experience while making their selection from the company's full range of award-winning spirits, from Cherry Bomb Whiskey, Portland Potato Vodka, and Below Deck Coffee Rum, to a variety of flavored liquors. "Our inaugural mall location represents a totally new and unique concept for the retailing of hand-crafted spirits," said Steven Earles, CEO of Eastside Distilling. "Mall shoppers can now enjoy the convenience and comfortable atmosphere of a local retail store and experience firsthand our unique and great-tasting products -- particularly our seasonal liqueurs, like Holiday Spiced, Peppermint Bark, and Egg Nog." 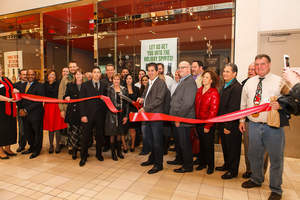 On Wednesday, December 17, the company hosted an official ribbon cutting ceremony for the new location, which was attended by North Clackamas County Chamber of Commerce Chairwoman Angela Fox, Commissioner Marvin Révoal of the Oregon Liquor Control Commission (OLCC), and the general manager of Clackamas Town Center mall, Dennis Curtis. "As one of the most visited malls in the Portland region, Clackamas Town Center is an ideal location for Eastside's beautifully appointed spirit tasting room," commented Ms. Fox. "Eastside's selection of this location reflects the growing strength of our local economy and how it continues to attract some of Oregon's most forward-thinking entrepreneurs." Stated Commissioner Révoal of the OLCC, "When we think about innovation, this is what it's all about. I applaud Eastside Distilling for creating new ways to improve the buying experience." Eastside Distilling has been producing high-quality, hand-crafted spirits in Southeast Portland's Distillery Row since 2008. In addition to Eastside's tasting rooms, the company's hand-crafted spirits can be found at finer liquor stores across Oregon, Washington, Georgia, Minnesota, Pennsylvania, Maryland, Tennessee, South Carolina and Wisconsin. Added Mr. Earles, "Given the positive feedback we've received at our Clackamas store, it appears our customers have really appreciated our products and the environment we've created. Based on this response, we are now evaluating plans to introduce this concept to other locations." The Oregon Liquor Control Commission (OLCC) was created in 1933 by a special session of the Legislature after national prohibition ended. Oregon is a control state with the exclusive right to sell packaged distilled spirits, which are dispersed statewide from a distribution center in Portland and sold in 242 retail liquor stores operated by contracted agents. The agency is headquartered in Portland with regional offices in Bend, Eugene, Medford and Salem. The OLCC distributed more than $416 million in the last two years to Oregon's General Fund, Cities, Counties, and Drug/Alcohol Abuse Programs. This money helps fund essential services such as schools, police and healthcare for Oregonians. Clackamas Town Center is the most visited mall in the Portland metro area due to its impressive collection of shopping, dining and entertainment. Opened in 1981, the mall is managed and co-owned by General Growth Properties. The mall is currently anchored by J.C. Penney, Macy's, Nordstrom, Sears and includes a 20-screen Century movie theater. For more information visit: www.clackamastowncenter.com. Eastside Distilling, Inc. (OTCQB: ESDI) has been producing high-quality, handcrafted spirits since 2008 and is located in Southeast Portland's Distillery Row. Makers of gold medal award winning spirits, the company is unique in the marketplace and is distinguished by its highly decorated product lineup that includes Burnside Bourbon, Below Deck Rum, Portland Potato Vodka, and a distinctive line of infused whiskeys. All Eastside spirits are hand crafted from natural ingredients in small batches for unparalleled quality and taste. The company is publicly traded under the symbol OTCQB: ESDI. For more information visit: www.eastsidedistilling.com.